Cytoscape Automation is a collection of features that enable users to create workflows executed entirely within Cytoscape or by external tools (e.g., RStudio, Jupyter, GenomeSpace, etc), and whose results are reproducible. This enables Cytoscape to scale to large collections of datasets and to larger more complex workflows than is practical via keyboard and mouse. Cytoscape Automation exists in two skins – the Commands interface and the Functions interface. Both can accomplish similar results, but are focused on different usage styles. Commands reprise user-initiated interactions (e.g., open session, import data, export image), whereas Functions enable programmers to manipulate and operate on networks as internal Cytoscape data. 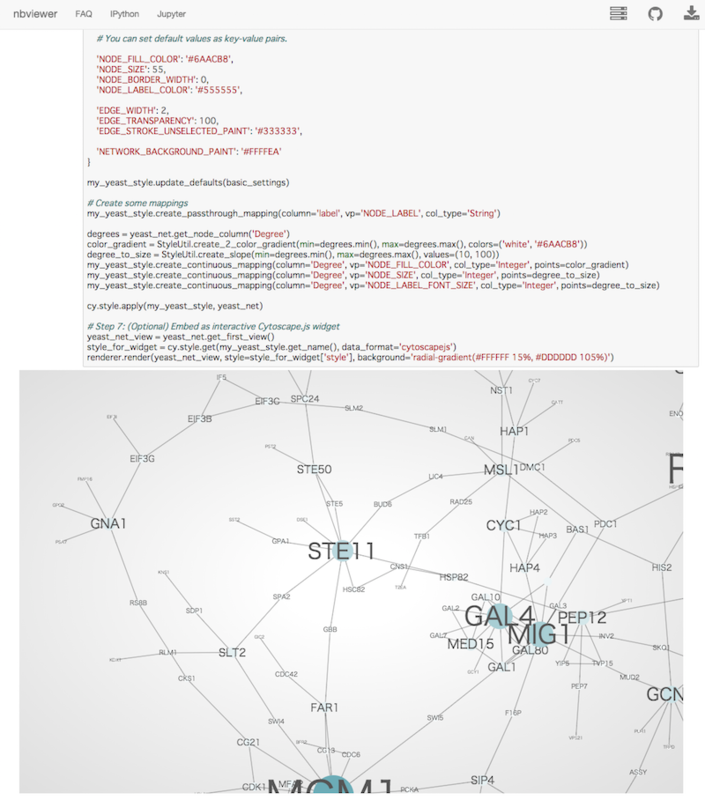 Commands and Functions both call Cytoscape (and Cytoscape apps) via a REST interface known as CyREST. This chapter describes how to produce custom workflows using CyREST natively and via Python and R interface libraries. More tutorials and examples are available at the Cytoscape Automation web page (https://github.com/cytoscape/cytoscape-automation/wiki). Note that for a Cytoscape app to be callable via CyREST, the app must be installed into Cytoscape and the author must have specifically added automation functionality to it. If there is an app you would like to call, but which doesn’t offer automation, please contact the app author and request that app functionality be added. Instructions for adding automation to an app are available on the Cytoscape Automation web page (https://github.com/cytoscape/cytoscape-automation/wiki). The Commands feature allows you to script a sequence of Cytoscape commands and menu items, where commands can have parameter values that would normally be provided by a user via a Cytoscape dialog box. For example, session open file=”C:\myfile.cys” loads a session from a file similarly to the File | Open menu item. Commands may resolve to Cytoscape core functions or automation-enabled apps installed in Cytoscape. You can create a command script file that Cytoscape can execute via the Tools | Execute Command File menu item or on the Cytoscape command line at startup. 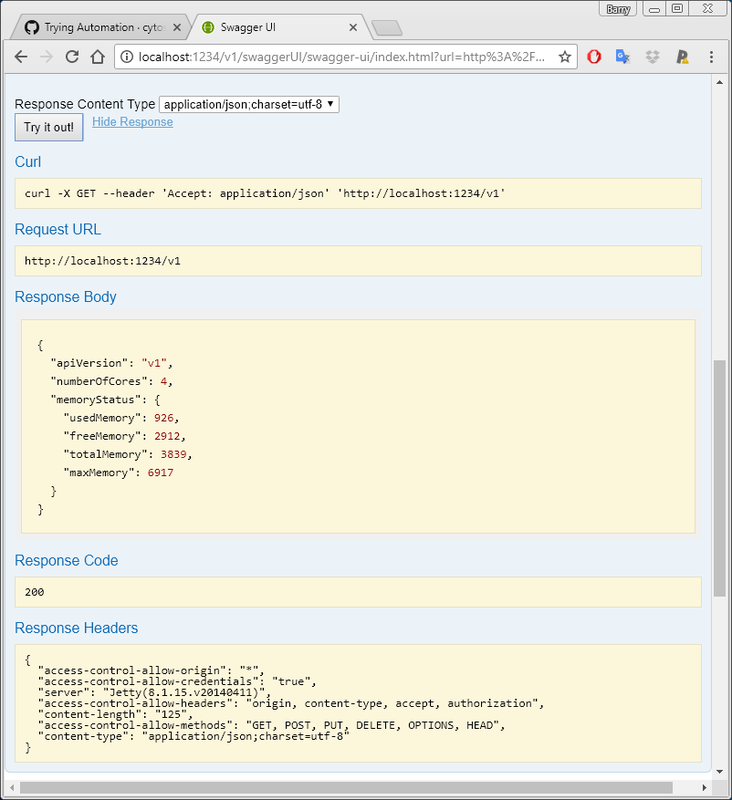 The CyREST API feature allows you to access Cytoscape from a separate application, thereby orchestrating Cytoscape operations via HTTP-based REST calls. Your workflows can execute either Commands or Functions in this way. Automation applications may be written in a general programming language that keeps its own data structures, performs complex flow control, or directly manipulates Cytoscape nodes, edges, attributes, and visual styles. For R and Python, we provide language-specific interface libraries (e.g., r2cytoscape and py2cytoscape) that present Cytoscape Automation in language-friendly terms, and call Cytoscape and apps via the CyREST interface. Commands is the built-in Cytoscape feature to automate your workflow as simple script. You can learn more about Commands in the Command Tool section. Note that the list of namespaces will vary depending on the apps you install – some apps provide Commands in namespaces of their own. 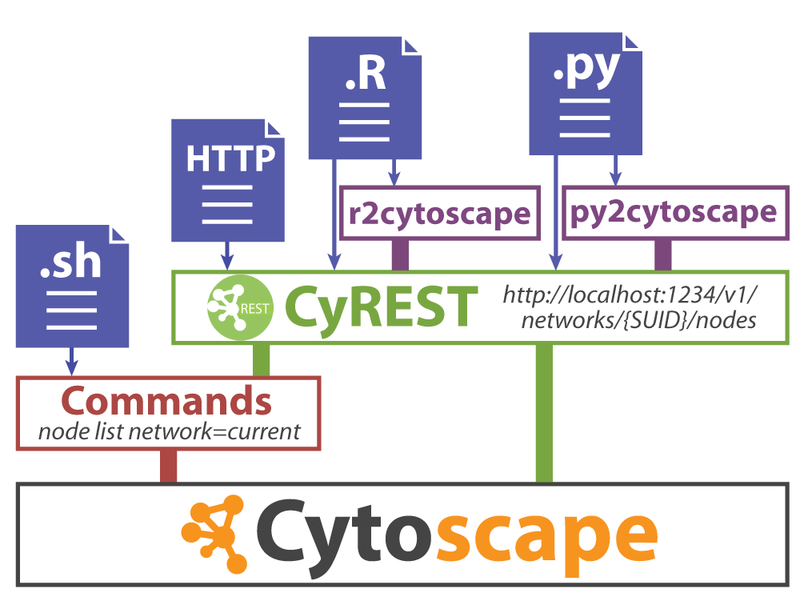 Note that if you expect to run more than one instance of Cytsocape on a single workstation, the CyREST port must be unique for each Cytoscape instance. 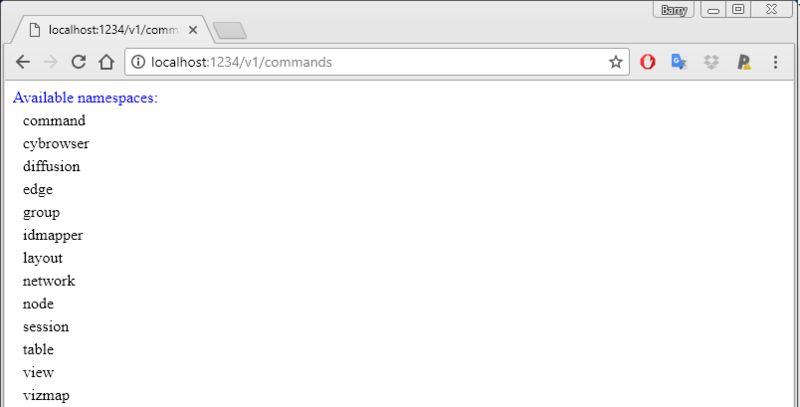 You must use either the property or command line parameter technique to execute each instance with a different CyREST port. Cytoscape makes a list of available Commands and Functions available via the Help → Automation submenus. 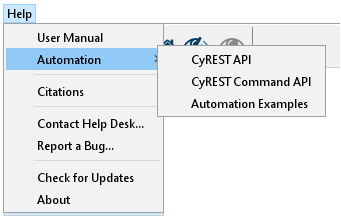 The CyREST API submenu shows available Functions, and CyREST Command API shows available Commands. Automation Examples leads to a web portal containing the bulk of documentation, samples and tutorials for Cytsocape Automation in general. Notably, Automation Examples contains a tutorial that explains how to explore CyREST Commands and Functions: https://github.com/cytoscape/cytoscape-automation/wiki/Trying-Automation. Note that the page contains a description, input parameters, output values, result code and the Try it out! button. Pressing the button executes the Function and shows the actual CyREST call and its results. Making good use of Swagger as a prototyping tool can greatly reduce code writing and debug time! To find out more about how to use CyREST, visit the Cytoscape Automation tutorial pages (https://github.com/cytoscape/cytoscape-automation/wiki/Trying-Automation). Note that Swagger pages reflect functionality in Cytoscape at the time it executes, including Commands and Functions contributed by installed apps. 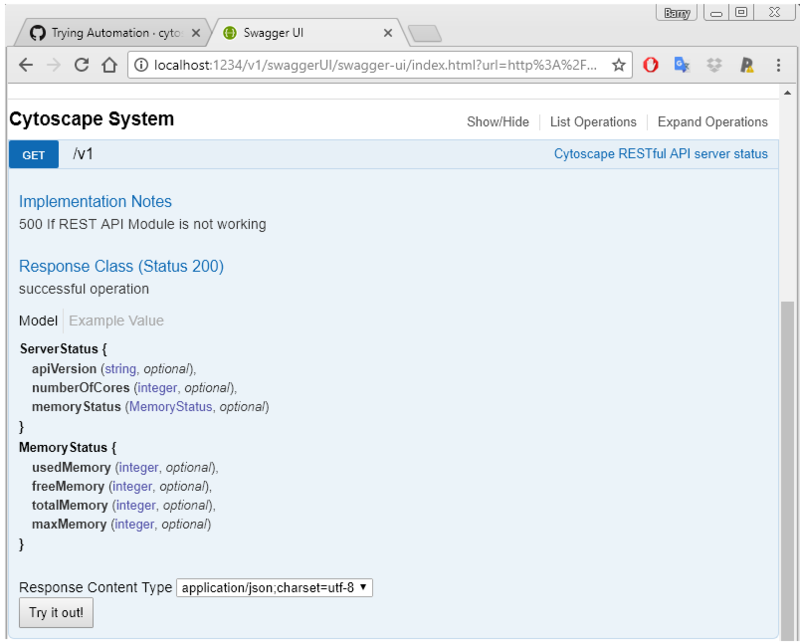 To discover CyREST functionality in uninstalled apps, you must first install them, and then use Help → Automation submenus to generate the Swagger pages (or simply reload your Swagger browser page). CyREST enables access to Cytoscape Automation features from workflows written in high level languages (e.g., R and Python) and executing in separate environments (e.g., RStudio and Jupyter) on the Cytoscape workstation. A workflow can call Commands and Functions either directly via CyREST or via language-specific interface libraries. To directly call CyREST Commands and Functions from a workflow, see the mini-tutorial. To understand and get started using language-specific libraries, visit the Cytoscape Automation web page (https://github.com/cytoscape/cytoscape-automation/wiki). The Workflow Index page contains useful code samples, and the Sample Scripts page contains working demonstration projects. Below is a sample Jupyter-based Python script and the resulting sample output.